This very large hydrotherapy complex is the successful culmination of seven years' planning and fundraising by the SNAP charity, which was set up by the Rotary Club in Chippenham, Wiltshire to fund this project for St Nicholas' - a local specialist school for cognition and learning. 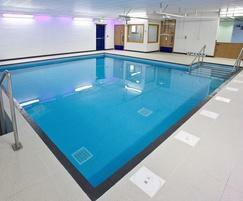 London Swimming Pool Company was selected as the swimming pool specialists by Bailey Partnership, the project managers. The facility has been designed to allow people with disabilities and special needs to enjoy the experience and benefits of water. 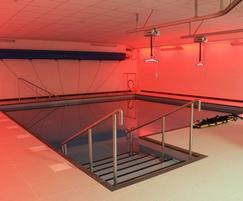 The pool features the latest technology such as an in-water interactive multi-sensory system and UV water treatment. A solar panel heating system provides a large amount of the energy required to keep the pool at a constant 34°C and greatly reduces the carbon footprint. 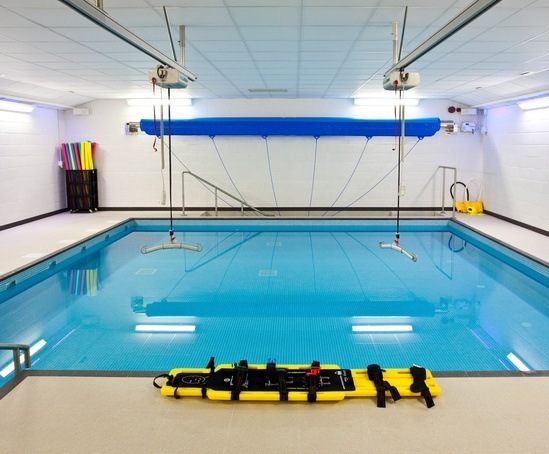 A mechanical hoist enables pool access for less able-bodied people and specialist-designed steps assist partially sighted users. The pool cover, supplied by Plastica, was custom-made to suit the unusual shape of the pool. The complex is separate to the main school building allowing the community to easily use the pool - currently there are 15 external groups benefitting from the fantastic facilities. 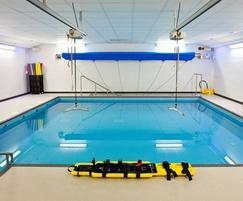 This project was awarded Gold 2013 for Special Requirements Pools by SPATA - Swimming Pool & Allied Trades Association.